After the joys of bluebell woods have faded the next not-to-be-missed highlight in the South Chilterns is the magnificent wisteria at Grey's Court. This wonderful gnarled specimen is said to be 125 years old and twists its way through a walled garden and then over a pergola walk. 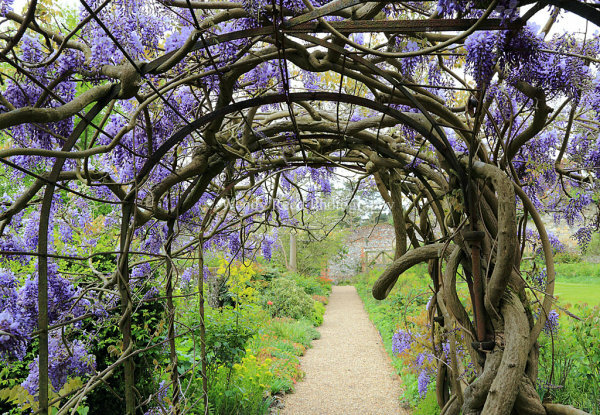 For many people in the Henley area, a visit when the wisteria is in flower is an annual pilgrimage. I visited on a blissfully quiet morning, with just enough milky sunlight to get some decent photos. The perfume was so heady I felt I could still smell it even after leaving the garden. Some of the flower racemes weren't totally in bloom but if you wait until this happens the wisteria has also produced lots of new leaves which rather detracts from the beautiful flowers. Thanks to insider knowledge from a garden volunteer I think I timed it just right!